The green number plate will carry white font for personal EVs, while commercially-operated EVs will get yellow font on the green plate. The Government of India has taken yet another step in pushing for greater adoption of electric vehicles in India with the approval of green number plates for EVs in the country. The move for the unique registration plates is intended to help raise more interest and enthusiasm behind EVs in India, PTI reported Nitin Gadkari, Minister for Road, Transport and Highways as stating. The adoption of EVs is still at a very nascent stage, and has a long way to go particularly in terms of publically-available infrastructure, and the Government is presently looking to expand these areas by encouraging more people to purchase EVs. The full statement by Mr. Gadkari states, "The government has approved distinctive green licence plates for electric vehicles to encourage people to use electric vehicles. Such vehicles will be fitted with green licence plates bearing numbers in white fonts for private cars and yellow font for taxis. Exemption from permit will be a game changer as restricted permit regime is a major concern. E-rickshaw growth is attributable to the permit exemption and there is scope to extend the exemption to e-buses, e-taxis, e-autos and e-bikes. E-autos and e-buses may have a big impact since getting a new permit is extremely difficult." The green number plates will make for the fifth type of number plates offered to civilians at the moment. These will feature white fonts for EVs owned as personal vehicles, while commercially operated EVs will feature yellow fonts. 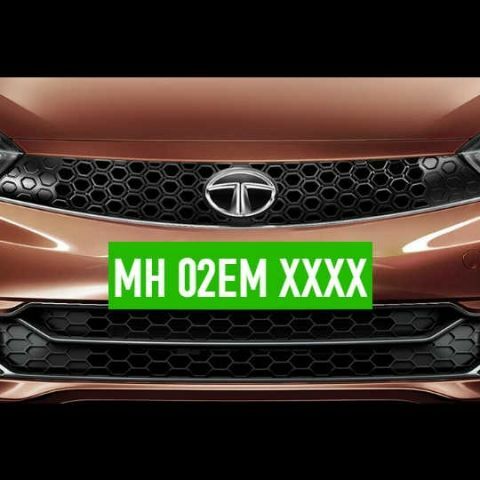 These number plates will not only be unique to signify EVs, but also entail a bunch of privileges and concessions to be put in place for early adopters of EVs. These may include toll concessions on highways, exclusive parking zones and specialised lanes in congested areas. Furthermore, commercial vehicle operators may soon be mandated to include a percentage of electric cars in their fleets to increase the adoption of electric mobility. This move may kick in onward of 2020, when India is expected to have a larger number of publically accessible charging stations. The adoption of electric vehicles has not yet taken off in India, although the Indian government has been persistent in their gradual push towards cleaner mobility options. With the new mandate of unique number plates, it remains to be seen if the concessions work as a particularly alluring factor for people to buy more electric cars. The government is also exploring concessions in taxes levied in batteries, which may eventually lead to more affordable EVs.